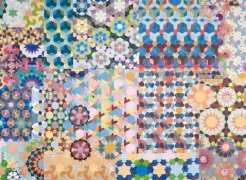 Joyce Kozloff was born in Somerville, New Jersey in 1942. She received a BFA from Carnegie Institute of Technology, Pittsburgh, PA in 1964 and an MFA from Columbia University in 1967. 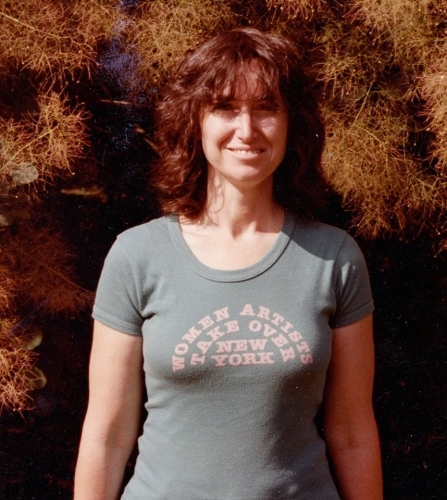 Kozloff was a major figure in both the Pattern and Decoration and the Feminist art movements of the 1970s. 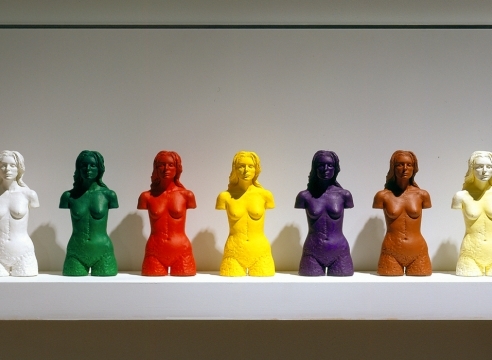 In 1979, she began to focus on public art, increasing the scale of her installations and expanding the accessibility of her art to reach a wider audience. 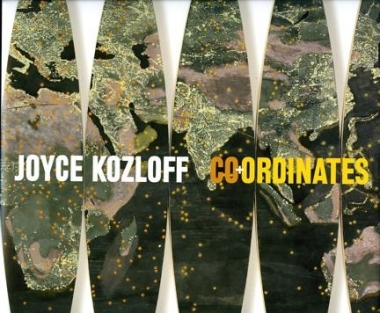 Kozloff has since executed a number of major commissions in public spaces, including Dreaming: The Passage of Time for the United States Consulate, Art in Embassies Program in Istanbul, Turkey; The Movies: Fantasies and Spectacles for the Los Angeles Metro’s Seventh and Flower Station, CA; Caribbean Festival Arts for P.S. 218, New York, NY; New England Decorative Arts for the Harvard Square Subway Station, Cambridge, MA; and Bay Area Victorian, Bay Area Deco, Bay Area Funk for the International Terminal, San Francisco Airport, CA. 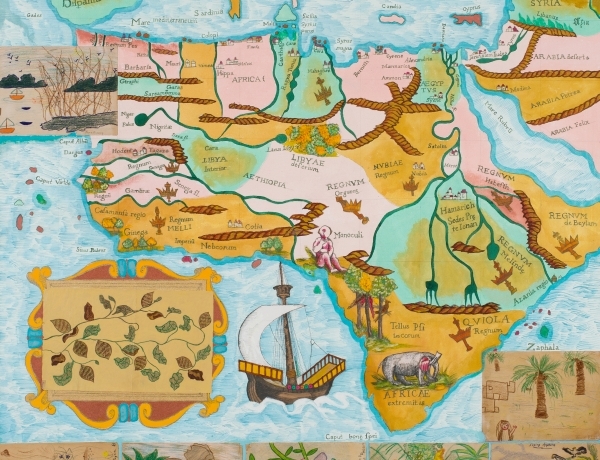 Since the early 1990s, Kozloff has utilized mapping as a device for consolidating her enduring interests in history, culture, and the decorative and popular arts. 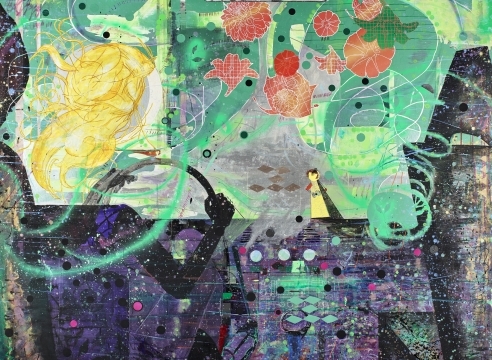 She initially concentrated on cities known to her, onto which patterns and images reflecting their colonial pasts were then overlaid. 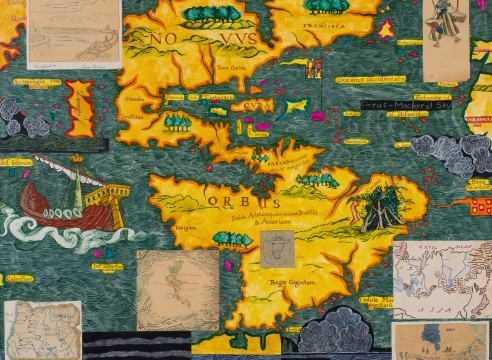 Subsequent series examined bodies of water and the inaccuracies of early maps from the so-called “Age of Discovery.” In 1999-2000, Kozloff was awarded the Jules Guerin Fellowship / Rome Prize from the American Academy in Rome, Italy. 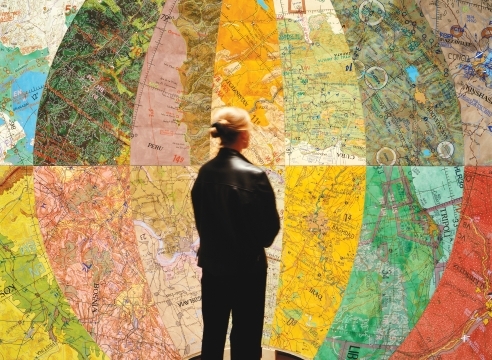 During her yearlong residency abroad Kozloff conceived and completed Targets, a nine-foot walk-in globe in twenty-four sections, each of which is painted with an aerial map of a place that has been bombed by the U.S. in the years since World War II. 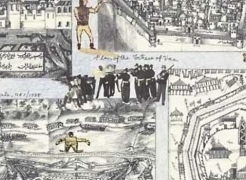 A 2001 residency at the Bogliasco Foundation in Liguria, Italy provided the genesis for Boy's Art, a series of twenty-four collaged drawings based on maps, diagrams, and illustrations of historic battles, which examine the fascination with war shared by many young boys. Distributed Art Publishers published an oversized artist’s book of these works in 2003. 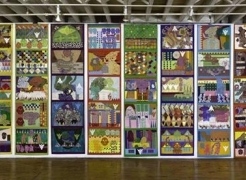 In China is Near, Kozloff explored the China accessible to her, visiting the Chinatowns of Mott Street, Manhattan; Main Street, Flushing, Queens; 8th Street, Sunset Park, Brooklyn; Webster Street, Oakland; and Grant Avenue, San Francisco – all destinations on the twenty-first century Silk Route. Her photographs convey the experience of these locations, capturing the sensory overload triggered by the surfeit of kitsch – gaudy trinkets, cheap apparel, and glittering electronics. 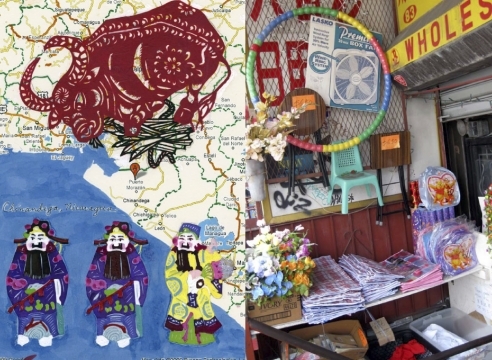 Reveling in the ways this visual clutter rhymed with her own layered, dense aesthetic, Kozloff paired these images with collages incorporating drawings of old maps, imagery from the internet, and Chinese characters and motifs. The resulting series, published as a book by Charta Books, presents a rich, immersive, unconventional chronicle of China, not a travelogue of a country visited, but of one traversed nonetheless. 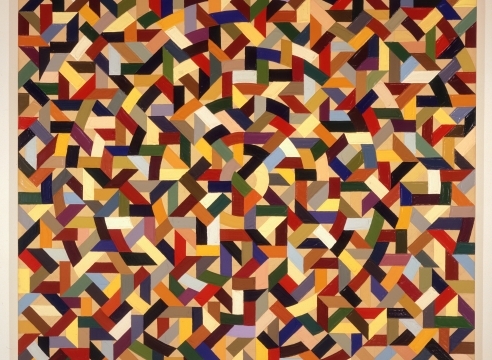 In March 2012, Kozloff’s JEEZ was exhibited at the main entrance to The Armory Show Modern. 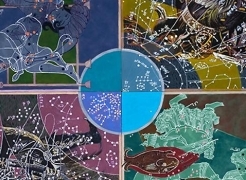 JEEZ is a twelve by twelve-foot painting in thirty-six panels based on the Ebstorf map, a 13th-century mappa mundi of the same size painted on thirty sewn goatskins. 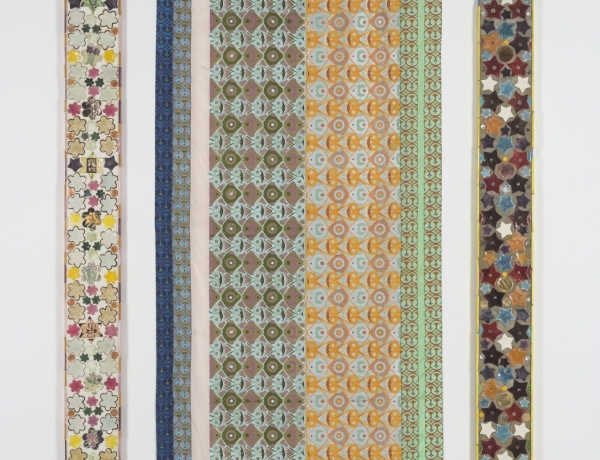 In her response to this historic work, Kozloff drew upon a wide range of her artistic practices, incorporating her interest in cartography, decoration, history, material culture, and politics. As a secular person, she was particularly motivated by the ongoing evangelical rhetoric of some candidates in the current U.S. presidential race. JEEZ is her subsequent attempt to grapple with the religious images that pervade Western culture. 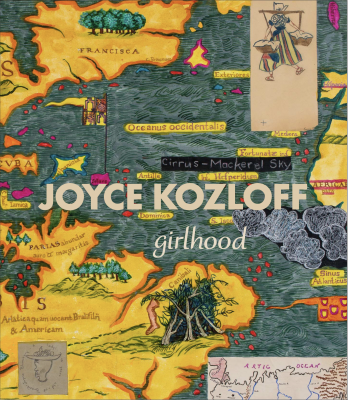 In JEEZ, Kozloff navigates through the history of art, incorporating everything from Byzantine mosaics to contemporary street art. She culls from sources high and low, from Old Master paintings to everyday kitsch, and encounters scores of representations of Jesus: black, Asian, Latino, and female; adult and infant; Jesuses from the movies and New Age hippie Jesuses. 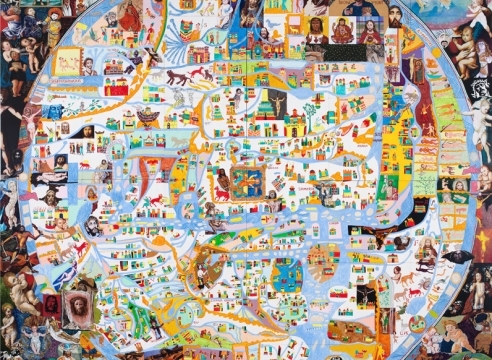 Over thirteen months, Kozloff painted 125 images of Christ into her contemporary mappa mundi. Each represents a stereotype from its culture, faithful to its own artistic ideal, but the proliferation of depictions wryly erodes their power. 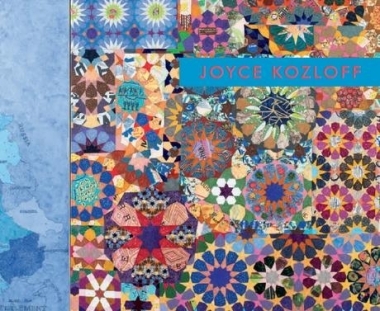 Recent solo exhibitions of Kozloff's work include: Joyce Kozloff: Navigational Triangles, DC Moore Gallery, New York (2010); Joyce Kozloff: Co+Ordinates, Trout Gallery, Dickinson College, Carlisle, PA (2008); Joyce Kozloff: Voyages + Targets, Spazio Thetis, Venice, Italy (2006); Joyce Kozloff: Exterior and Interior Cartographies, Regina Gouger Miller Gallery of Carnegie Mellon University, Pittsburgh, PA (2006); and Joyce Kozloff: Topographies, Contemporary Art Center of Virginia, Virginia Beach, VA (2002). 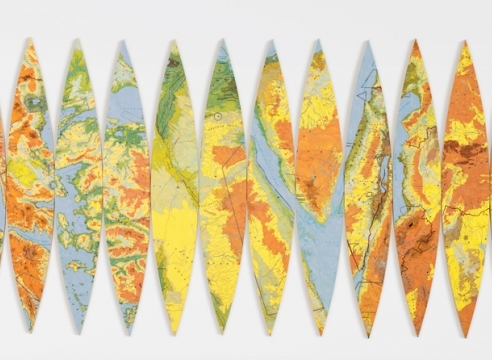 Crossed Purposes, a major traveling exhibition pairing the work of Joyce Kozloff with that of her husband, photographer Max Kozloff, was organized by the Butler Institute of American Art in Youngstown, Ohio and traveled to a number of museums around the country during 1999 and 2000. 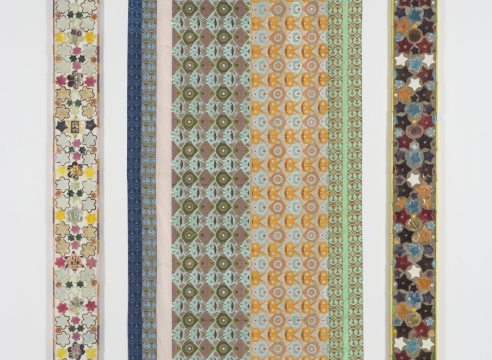 Kozloff's work has been included in countless important group exhibitions, including WACK! Art and the Feminist Revolution, which originated at The Geffen Contemporary at MOCA in Los Angeles, CA in 2006 and traveled to the National Museum of Women in the Arts in Washington, D.C.; P.S. 1 MOMA in Long Island City, NY; and the Vancouver Art Gallery in British Columbia, Canada. 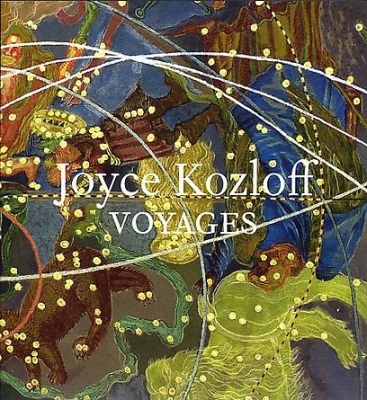 Kozloff has served on the Board of Governors of the Skowhegan School of Painting and Sculpture (Skowhegan, ME) since 1998 and has been a member of the National Academy of Design since 2003. She was on the Department of Art Advisory Board at Carnegie Mellon University (Pittsburgh, PA) from 1992-1998, the Board of Directors of the College Art Association from 1985-1989, and the Advisory Board of the Public Art Fund from 1984-1986. 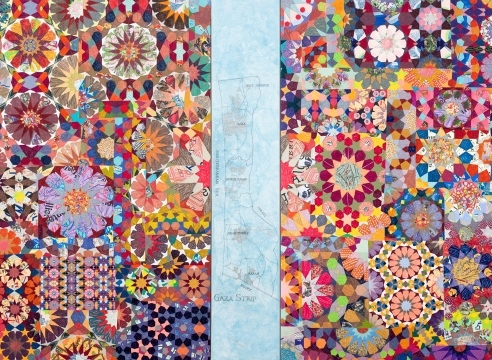 Artist's Panel: On the Exhibition "Pattern and Decoration: Ornament as Promise"
Hyperallergic.com: "Joyce Kozloff: Maps + Patterns"
Joyce Kozloff's solo exhibition "Girlhood" will be on view at DC Moore Gallery from October 5 - November 4, 2017. 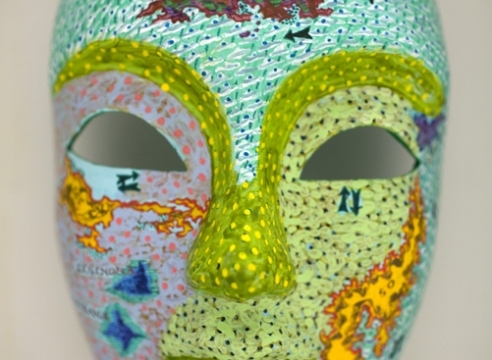 See what inspired her most recent body of work. 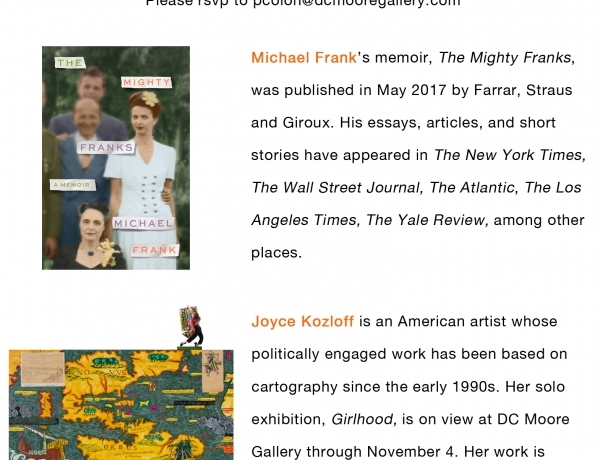 Women, Archives, and Artistic Legacy: The Feminist Collecting Initiative at the Archives of American Art from DC Moore Gallery on Vimeo.